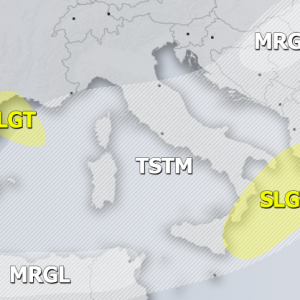 A robust severe weather period is shaping up for the next 5 days from western Europe towards the N-CNTRL Mediterranean. Numerous severe storms with threats for large hail, damaging winds, torrential excessive rainfall and tornadoes / waterspouts are expected. The first day of severe weather is expected today, Thursday 17th over W France into S UK as a short wave trough moves across eastern Atlantic and the Bay of Biscay. Refer to the Severe Weather Outlook DAY 1 – 17/07/2014 for more details. The upper trough gradually deepens towards Friday 18th and becoming negatively tilted while being pushed further east. This will result in strongly backed LL flow over France which should perfectly combine with extreme instability resulting from rich boundary layer moisture. Strong shear will be available for organized robust severe storms, including supercells capable of producing large hail, damaging winds, torrential rain and some tornado threat. Storms are expected to merge into large cluster over W France while spreading northwards overnight to Saturday, this will bring excessive rainfall threat as well. On Saturday, when the upper trough is fully negatively tilted and moving across France, more severe storms are expected over the country and spreading into Benelux. Very strong instability and moderately strong shear should easily result in organized storms, including supercells with large hail and damaging winds. Storms will have a high tendency to merge into large cluster where bowing segments / squall lines are increasingly likely to affect Benelux Saturday’s night. After Saturday, a negatively tilted upper trough transforms into an upper low while crossing the Alps and acts as a closed low moving across N-CNTRL Italy towards central Balkans. This will result in a robust environment also over N Italy on Sunday and along the Adriatic sea on Monday and Tuesday. Further details will be posted in Severe weather outlooks, see here: Severe Weather Outlooks DAY 1.